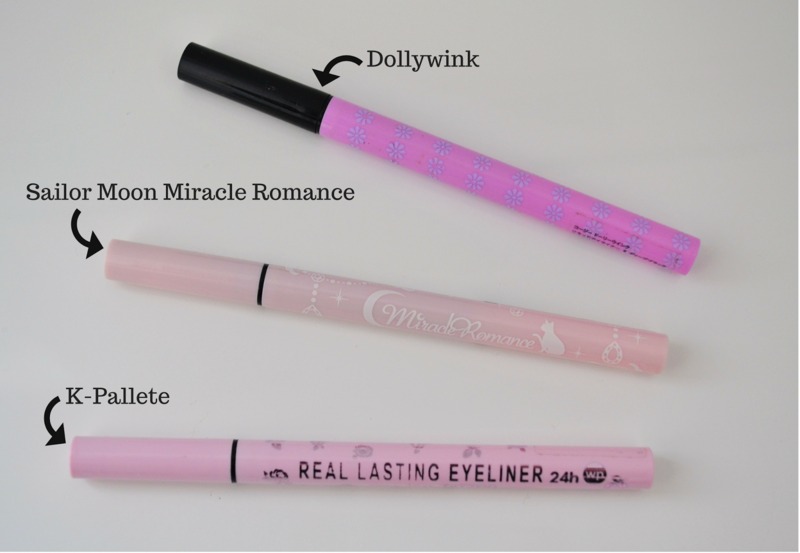 I'm always looking for a good eyeliner that is easy to apply and stays put. In Hong Kong, I became quite the regular at SASA and I often left with something new to try. I also find a lot of Asian makeup products too cute to resist, which then leads me to leaving with more than I should. Anyway, I thought I'd give a quick run down on the liquid eyeliners I used there in case anyone's thinking of trying one out. All three have a brush tip and are the same size, so the main difference between them is the formula. Also, I should probably mention that my eyelids do get oily towards the end of the day so finding a liner that stays can be a challenge! I've been waiting to try this out for years after hearing great things about it. I hadn't used many eyeliner pens before using this one but because of the small tip, it was really simple to get the hang of. However, I started wearing it in August and it didn't stand up too well to Hong Kong's heat and humidity. We're talking noticeable fading towards the end of each day. It worked a lot better when the weather cooled down though so I'd recommend it if you aren't facing tropical weather. I'll admit that I bought this purely because it's Sailor Moon related. However, it turned out to be very impressive! It goes on easily and had I found the lasting power to be decent. Plus, you get adorable Sailor Moon packaging. Win-win! This liner is highly recommended across the internet - and rightly so! On some days I've noticed it fading and transfering a little by the end of the day but generally it doesn't budge. It's waterproof which I appreciate greatly now that I'm back in the UK. The downside is that it's the most difficult to remove out of the three so you'll need a good eye makeup remover. The packaging for this is usually black but I think I got a special edition which is pretty adorable. i'd love to try some asian beauty products, these look cool! The packaging is great! Definitely go for the K-Palette one if you do end up trying any of them!